If you have ever been to NYC and you haven't been to Chinatown, you are absolutely missing out. It's one of the most fascinating places in the city, from the crazy food you can find to the street markets with some smelly mysteries to fake bags and phone cases, this place has it all. Every time we go I can't get over it. It actually feels like I have left the country and am roaming the streets of China. To say I am obsessed with this little floral number would be an understatement. You know those dresses that you just put on and you're like YUP this is it! You know you will like it every time you put it on and it works for every season so you know it's GOOD! That is this dress! I linked a few other favorites below if you are looking for the perfect holiday outfit, I got you! Hope everyone is enjoying their December and getting ready for Christmas. 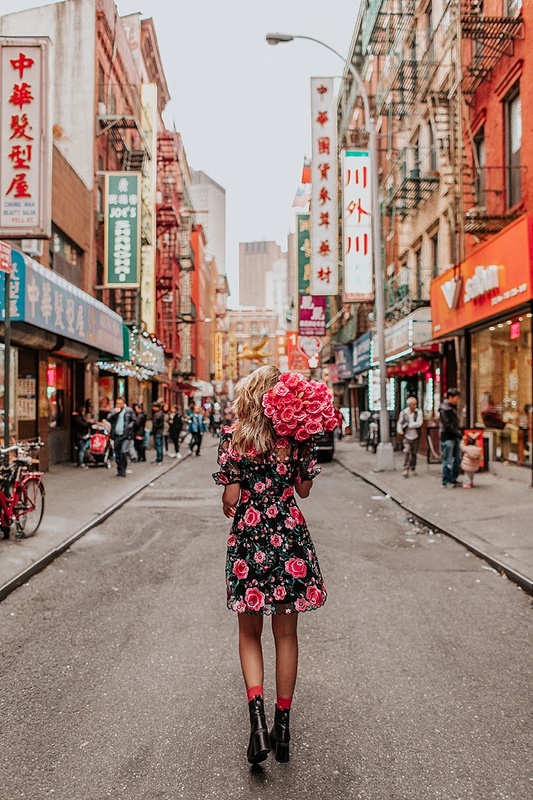 I absolutely adore your outfit -- but Chinatown has to be the most gorgeous backdrop! I love dress is beautiful!